It was nearly midnight in Madina, a suburb of the Ghanaian capital Accra. Alhassan's family was sitting together talking outside the family home, as they often did late into the night. His brother, Ahmed Hussein-Suale, had just left to check on a nephew who was sick. When the sounds of the firecrackers stopped, and the ordinary noise of the neighbourhood settled, Alhassan turned his attention back to his family and he didn't think about the sounds again until a man came running towards him crying out that his brother was dead. One hundred metres down the road, Hussein-Suale, who was 31, lay slumped in the driver's seat of his dusty blue BMW with bullet holes in his chest and neck. Eyewitnesses said he was killed by two men who fired at the car from close range as it slowed for a junction. The first bullet hit Hussein-Suale in the neck and the car accelerated, crashing into a storefront. One of the gunmen calmly approached the driver's side and fired two shots through the broken window directly into Hussein-Suale's chest. Then he turned to those watching, smiled and raised a finger to his lips. Three witnesses to the crime who live nearby told the BBC they saw the men hanging around the junction on several occasions in the week before the killing - two unfamiliar faces in a familiar neighbourhood. The men, one tall and well-built, the other short and wiry, leant on their motorbike or chatted with neighbours to pass the time. They bought alcohol from a shop and helped a man carry pails of water. One neighbour said they seemed suspicious. Another said she thought they were robbers. But nothing was stolen from Hussein-Suale and no-one close to him believes he was a random target. He was an investigative journalist whose undercover reporting had exposed traffickers, murderers, corrupt officials and high-court judges. He worked with Tiger Eye, a highly secretive team led by one of the most famous undercover journalists in Africa, Anas Aremeyaw Anas. In Ghana and beyond, the team's daring, anonymous reporting made them modern-day folk heroes. And it made them enemies. When Tiger Eye aired its latest investigation, which exposed widespread corruption in African football, Ghanaian MP Kennedy Agyapong began a campaign of hostility against the team, saying he was offended by its undercover methods. He called publicly for Anas to be hanged. Weeks after the film was screened, in June last year, he used his own TV station to attack Hussein-Suale and expose the journalist's most closely guarded secret - his face. "That's him," said Agyapong, as images of Hussein-Suale appeared on screen. "His other picture is there as well, make it big." Agyapong revealed Hussein-Suale's name and the neighbourhood he lived in. "If you meet him somewhere, slap him… beat him," he said, staring into the camera. "Whatever happens, I'll pay." Across much of Africa, authoritarian regimes have effectively suffocated the free press. But in a handful of less-repressive countries, tenacious young journalists are holding the powerful to account and advancing a culture of investigative reporting. Ghana is top of this list. Last year the country was ranked first in Africa on the annual Reporters Without Borders press freedom index. Globally it ranked 23rd out of 180 countries - well ahead of the UK (40th) and the US (45th). Anas and his team are the nation's most high-profile reporters. 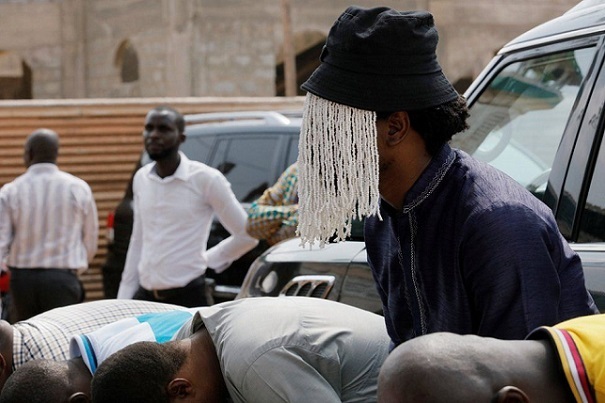 Anas has been praised by the country's president, Nana Akufo-Addo and by President Barack Obama, who said he saw the spirit of democracy "in courageous journalists like Anas Aremeyaw Anas, who risked his life to report the truth". 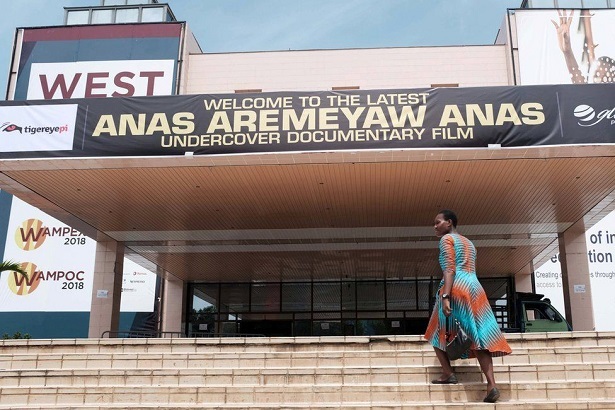 In his 20 years of undercover journalism, Anas has posed as a female investor in high heels and lipstick; worked as a janitor in a brothel; got himself sent to prison; and hidden inside a fake rock at the side of the road. In public appearances, he wears a striking disguise - a hat with a multicoloured veil of beads that hangs in front of his face. In Ghana it has become a symbol of resistance to corruption that is graffitied on walls around the capital. But behind the mask there is not just Anas's face. There is a team of highly skilled investigative journalists that put their lives at risk to report stories, and Hussein-Suale was chief among them - Anas's chosen team leader. Anas had already made a name for himself as an undercover reporter and Tiger Eye was a fledgling team. Hussein-Suale sought him out the same way several early Tiger Eye employees had, by asking around until someone could tell him: that is the man known as Anas. Anas responded the way he did to all potential recruits - he set him a test: travel to Tema, north of Accra, and report a story there about cocaine. Hussein-Suale went to Tema and promptly failed. He blew his cover and got himself arrested. "He did not perform to my expectation," said Anas, "and that was that." But Hussein-Suale wrote Anas a long letter explaining why he should be given another chance. "So I gave him another chance," said Anas, in an interview with the BBC last week. "And from that day he excelled from one investigation to the next." His cubicle at Tiger Eye's offices had notes and documents from various investigations piled on the desk and pasted on the walls. "He would go out quietly and do a lot of background work," said a fellow investigator, "so that when we came on to the story we knew exactly what we were doing." But he also had a playful streak. "I got annoyed with him once," recalled Seamus Mirodan, the director of Spirit Child. "One of the villagers gave him a just-slaughtered guinea fowl as a gift." Hussein-Suale put it in Mirodan's tripod bag and it released its bowels all over the inside. Not everybody appreciated Tiger Eye's methods. The team faced accusations of entrapment. "It is wrong to induce somebody by an enticement of something lucrative, big money or whatever, then turn around and say the person is corrupt," said Charles Bentum, a lawyer for several judges implicated in the expose. "You cannot exonerate the enticer and condemn the victim." The judiciary story made Anas famous in Ghana. Behind the scenes, Hussein-Suale's combination of diligence and mettle was impressing his boss; he was becoming Anas's right-hand man. In early 2018, Anas asked Hussein-Suale to accompany him to Malawi for a grim story about "muti" - the practice of harvesting human body parts for good luck rituals - that a young Malawian journalist, Henry Mhango, had brought to them. "I chose Hussein-Suale because I knew he had the capacity to withstand the shocks," said Anas. But the villagers had noticed the unfamiliar men meeting among the trees and suspected them of being child killers. They attacked the team, first with their feet and fists then with stones. Anas's suit was slashed up the back with a knife. The hidden cameras kept recording as the attacks intensified. "I'm here, I'm here, let me hold you," Anas said quietly to Hussein-Suale. Then: "They are going to kill us." They were saved by a courageous group of villagers who put themselves between the team and the attackers and helped them reach the house of the village chief. The mob was trying to force the door and Mhango, on his first undercover job, was shaking. Hussein-Suale sat next to him. "He told me to forget my surroundings and be strong," Mhango recalled. "He said, 'Henry, these are the incidents that encourage us to do even more, because our work is to fight evil.'" "He told me stories about Ghana and he gave me stories in Malawi. He had a huge effect on my career," said Mhango. "His death it not only a loss to Ghana, it is a loss to all of Africa. He was a journalist for Africa." Shortly after the team returned from Malawi, Tiger Eye would produce a story that would make headlines across the continent and beyond. "Number 12" was an investigation into corruption in football refereeing, and Hussein-Suale again took the lead. Referee after referee in Ghana accepted cash gifts from undercover Tiger Eye journalists, and the team set its sights beyond the nation's borders. By the time the investigation was finished, nearly 100 football officials across Africa had accepted cash, including a Kenyan referee slated to officiate at the coming World Cup. The investigation led to a cascade of bans and resignations. At the top of the list was Kwesi Nyantakyi, the head of the Ghanaian FA and a member of Fifa's elite council. Mr Nyantakyi had flown to Dubai for what he believed was a meeting with a sheikh keen to invest in Ghanaian football. When he sat down in a hotel room opposite "HH Sheikh Hammad Al Thani" and stuffed $65,000 in cash into a black plastic bag, he could have no way of knowing the quiet man who arranged the meeting was Ahmed Hussein-Suale. Mr Nyantakyi was banned from football for life, and the investigation delighted Ghanaian football fans sick of the corruption crippling the sport. It also infuriated some of Ghana's most powerful people. Kennedy Agyapong, an MP from Ghana's ruling party, railed against the group, saying he was offended by the way they conducted investigations. He obtained Hussein-Suale's name and location and made them public. Tiger Eye was forced to activate safety protocols: members left Accra; the main offices were abandoned and remain largely unused; and Hussein-Suale travelled to the north, returning periodically to the capital. When his family saw the footage of Agyapong's rant, they urged Hussein-Suale to leave Ghana entirely, but he resisted. "He was of the view that he did not do anything wrong, that he did what he did to save the nation, so why should he leave," said Alhassan. Anas also instructed Hussein-Suale to take a back seat amid the publicity. Begrudgingly he did, and in time he agreed to stay away from the family home for a period. But it jarred with his character. He pushed Anas to bring him back to investigative work and he began to return to Madina. He preferred to pray at his usual mosque. He felt safe in his home neighbourhood. "You could compare it to a gangster film," said Tiger Eye's lawyer Sammy Darko. "The gangster always feels safe in his neighbourhood because his friends and his family are around him." But Ahmed was not a gangster. He was a journalist, a son, a husband, and a father to three young children. His murder has shocked Ghana and reverberated beyond its borders, drawing condemnation from President Akufo-Addo and from the UN. Press freedom activists say they fear a chilling effect for journalism on the continent. "It is the ultimate form of censorship," said Angela Quintal, Africa co-ordinator for the Committee to Protect Journalists. "You censor the person that is killed; you censor the team they work with; and you send a message to others: if you cross the line we will get you." A spokesman for Ghana's police force told the BBC that all the evidence they had pointed towards a targeted assassination, and they were pursuing lines of inquiry related to Hussein-Suale's work. Kennedy Agyapong has been informally questioned by police. He denies any responsibility for the killing, and claims Anas and his team are blackmailers who use dubious methods. Asked by the BBC if he now regretted publishing Hussein-Suale's personal information, he said: "I don't regret anything at all because they are evil." Whoever is behind Hussein-Suale's murder, they may find that their actions have the opposite of the desired effect. In the days after his death, applications flooded in to Tiger Eye from young Ghanaian journalists keen to follow in his footsteps, Anas said. In time, Anas will vet them. Some may be set a test. "We will continue to fight," he said. "Ahmed always said posterity would not forgive us if we did not fight." Others vowed the same. "What happened to Ahmed will not hold me back," said Manasseh Azure Awuni, an investigative journalist with Ghana's Multimedia Group. "As I speak to you I am working on an investigation, and it will be broadcast in Ghana in the coming weeks." Hussein-Suale was laid to rest last weekend in Accra. His funeral was attended by family, friends, politicians from various parties and strangers from across the city. His murder has left a family bereft. As well as his own three children, Hussein-Suale had taken in a nephew - the son of a brother who died in the line of duty as a policeman - and he supported numerous extended family members. He covered university fees, contributed to wedding funds and paid for the upkeep on houses. He was naturally generous, said his brother Kamil. "That is how we were raised. If you have something small, you share." In Madina, Hussein-Suale's family still gathers each night outside the family home. Last night they were there. For 20 years they have come together after work and prayers to sit and talk, about nothing in particular, always out front, where friends and neighbours who pass by might stop and talk for a while too. Sometimes there are more than 20 people together until the early hours, sometimes there are less. The night Hussein-Suale died there were six or seven - close family and friends. He spent his last few hours with the people who raised him and shared his real life. He was quiet, as usual, and distracted by his phone, but he was in a good mood. Not everyone there knew exactly what he did. They loved him for the man he was that night in Madina. Across Ghana, people were more free because of his work.